Electric bicycles have the potential to change the world for the better. For while an electrically assisted cycle may not be as environmentally benign as a conventional pedal powered bike, they offer the very real prospect of luring drivers from their cars. It’s an argument that is lost on those who have yet to experience an EPAC (electric power assisted cycle) or pedelec. The effort of stop start riding in town is negated by a silent motor that whisks you to a a speed of just over 15mph and hills cease to be a challenge. Purists will see this as a kind of cheating, but the idea that battery assisted cycles are for the lazy is false. Not only do pedelecs open cycling to the elderly, disabled and those wishing to carry passengers or heavy loads, but in our own experience they seem to encourage more pedalling effort at cruising speed, not less. Britain is being slow in its uptake of electric bicycles, but given our general reluctance to take to two wheels perhaps that’s hardly surprising. Elsewhere in Europe and in Asia, sales are soaring. 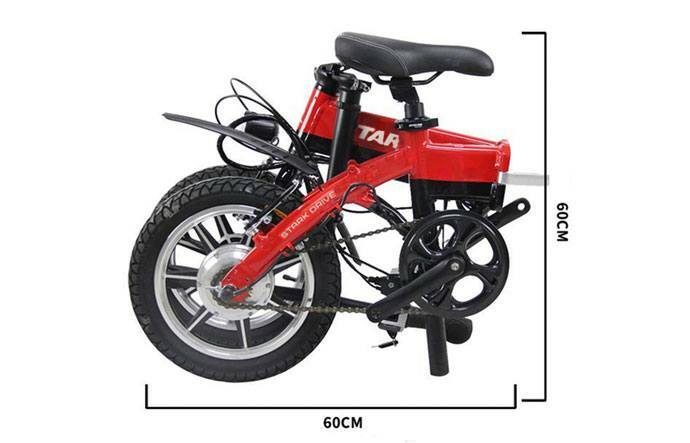 In fact, while we decide whether they’re a good idea or not, the electric bicycle is evolving. Europe has already made provision in law for so-called speed peddlers. These faster machines are capable of speeds of up to 30 mph and are capable of travelling over 70 miles on a single charge – they are perfect for commuters using main roads who want clean, fast and quiet alternative to commuting by car. Here in Britain, we have yet to make provision in law for speed pedelecs and insist that they be registered as a moped. One barrier to the uptake of electric bicycles in Britain has perhaps been price. All that may be about to change with electric bicycle manufacturer Stark Drive. Like so many young entrepreneurs, Oscar Stark took his ideas to the crowdfunding community and last year his company Stark Drive delivered its first consignment of electric bikes. Now they’re back with an ultra-compact folding electric bicycle priced at £233. The Stark Drive Mini boasts a 250w motor, 36v in-frame battery and 25-mile range as standard with buyers offers the opportunity to specify various upgrades including puncture-proof tyres, GPS tracking and carbon belt drive. The diminutive Mini is unlikely to replace the need for a full-size bike, its weight of 13kg and ability to fold small enough to store under a desk, in the boot of a car or even the overhead locker of a passenger aircraft means this clever design has the potential to replace many short car journeys. On the face of it, one cycle insurance policy is much like another, but the devil is the detail. Check your small print for so-called ‘new-for-old’ replacement – many insurers use the term, but if your bicycle is more than a few years old, devalue it severely. This means you are left out of pocket when you come to replace it. With ETA cycle insurance, however old the bike, if it’s stolen you get enough to buy a new model. Furthermore, every cycle insurance policy you buy from us helps support the work of the ETA Trust, our charity campaigning for a cleaner, safer transport future. No wonder The Good Shopping Guide judges us to be Britain’s most ethical insurance company. Is this true? Wow if so, I am not too proud to go electric.